I, like a lot of people I’d imagine, love to know that pages that I have are being looked at. This blog, myspace, facebook..something happens when you get an email and you know that somebody “poked” you or left you a comment or something, it’s wonderful! 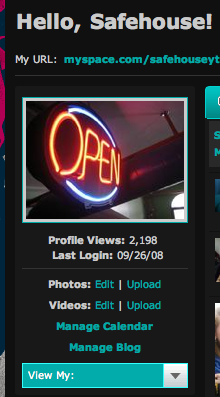 I have a myspace. The Safehouse, the youth organization I work for, has a myspace. There is just one small problem that I’d like to express (and hopefully solve, somehow). Notice the page views: 5,437. I’m happy with that. I haven’t had the myspace that long. I think it’s great that so many people visit. Notice the page views there: 2,198. Ouch. I run both of these sites. And I honestly would rather have more people hitting up the Safehouse myspace than my own. 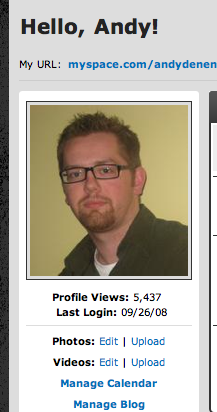 I have had a myspace for far less time than the Safehouse has had one. The Safehouse myspace is www.myspace.com/safehouseytown . Add us? The Safehouse has got too great a message to only have 2,000 views. Plus, we just launched a brand new layout..and it is SWEET! This entry was posted in hmm..., ministry, safehouse. Bookmark the permalink.